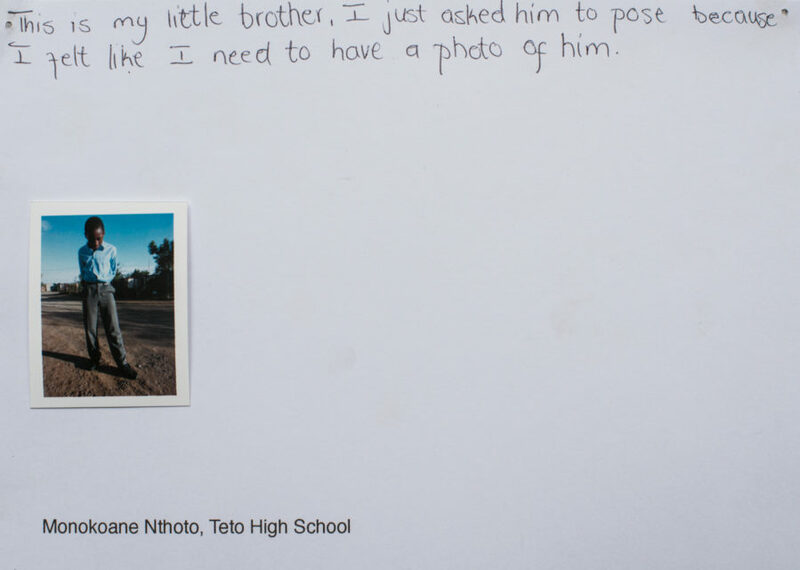 Lebo Tlali is one of the initiators of Welkom Today, a multivocal photography project about the South African town Welkom. Together with Dutch photographer Ad van Denderen, he is carrying out this project for the upcoming years. 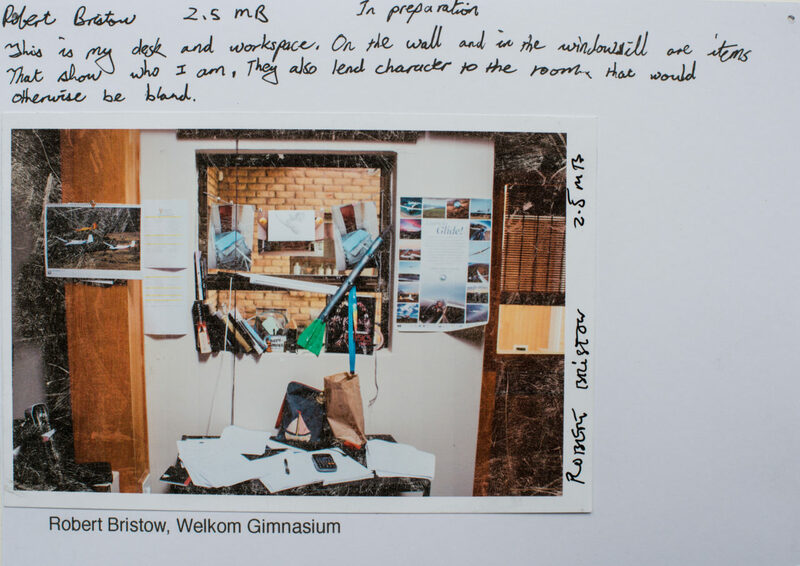 The latest steps in the project were a pop-up exhibition with work by Ad and several photography workshops with students of three high schools in Welkom. In this interview, Lebo shares his experiences. Why did you want to bring Ad’s photos back to Welkom? For about 18 years I held an unresolved desire that arose after seeing Ad’s book “Welkom in Suid Afrika” the first time. I had a strong need to share this impression I experienced with the rest of my community. Being young and I guess still lacking in confidence it never occurred to me this would be possible till about 2 years ago after seeing the book again and by then studying in Switzerland at Kaospilot, an alternative business school. My community has a record of their history and heritage in these images and my sense was that they would highly appreciate seeing them, like I did. 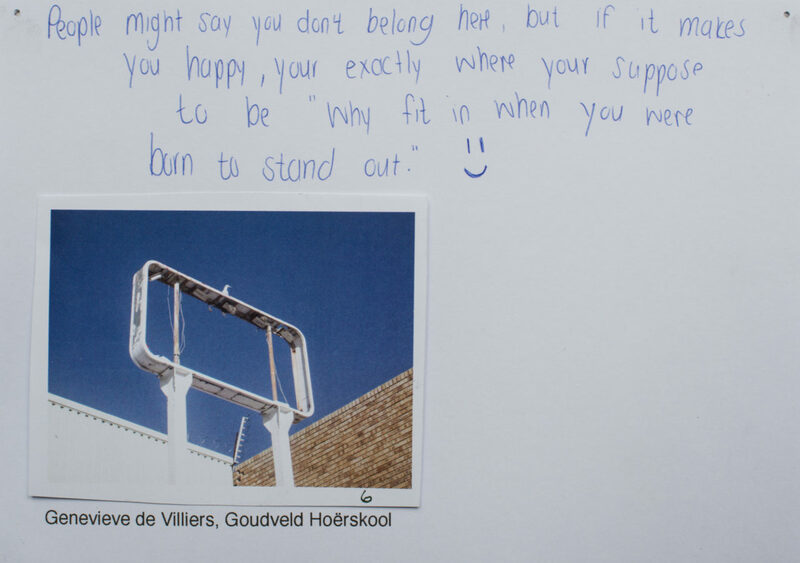 How did the residents of Welkom respond to the pop-up exhibitions with Ad’s photos you showed this November? There was a great deal of praise and appreciation! People also had a lot of questions and were super curious while we were setting up the expos, both in Thabong and in Welkom. Some had a lot to say about their own memories of the city. What was also striking was the broad spectrum of people who passed by and stopped to ask questions or comment, kids and adults. This was not a usual occurrence, to see a display like this in a town with no galleries and museums. Yet people still had the same human response from seeing something that moves them in some way. We still have a long way to go in South Africa – especially in smaller towns – when it comes to sharing the value of arts and culture. But somehow I believe people do “get it” on an instinctive level. This is also one of the best aspects of photography, most people are used to seeing images and they have their impressions about what they see. 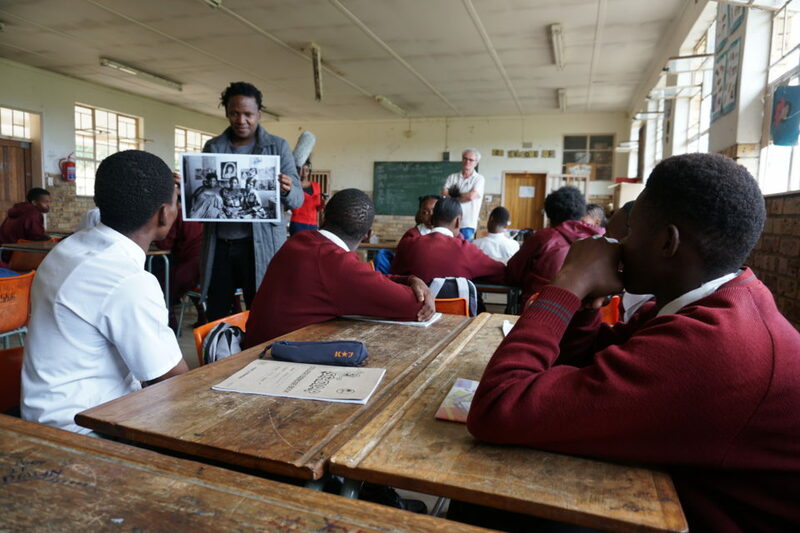 Why did you want to give photography workshops to the students of Welkom? I had a strong desire to not merely have an exhibition that would pass by and be forgotten. After growing up in one of the most unequal countries in the world, I am aware of the power of education and how it leaves lasting impressions that could lead to self empowering choices and opportunities. The book by Ad has made a big long lasting impression relating to where I am today. I felt the need to elaborate and share this further and practically with the younger generation. By giving the youth an opportunity to try out photography, Ad and I opened a door that rarely gets opened for some of them. The kids now have another way of seeing reality and can perhaps recognize their own self worth through the work they produced. The realities of some of the kids growing up in Welkom today are still similar if not the same (or worse) than when I was in High School myself. 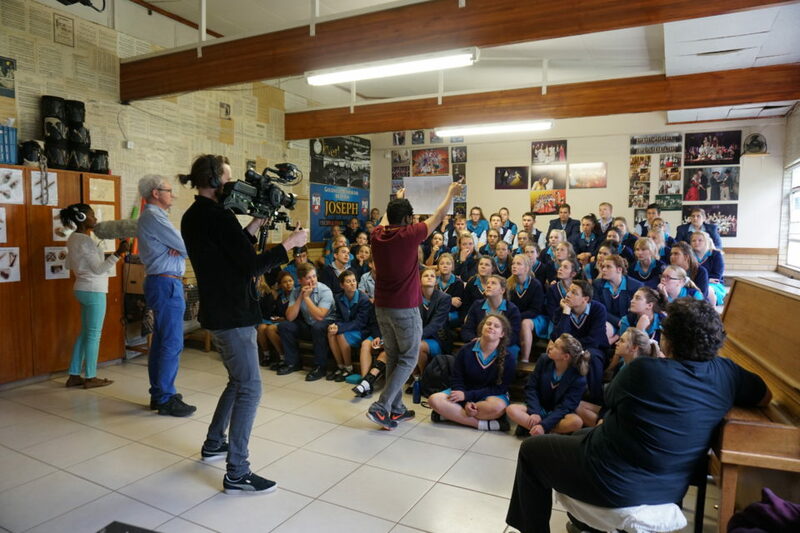 Giving these workshops was a joy beyond anything else and created an opportunity for the 3 different schools to wonder and learn about each others realities. What was the most remarkable experience you had during the workshops? Each school made its own remarkable impression on me and having grown up during Apartheid I had never entered premises of previously white schools before this project. It was something to get used to from the beginning and by the end of the workshop it felt like I had always been there. I enjoyed the immense curiosity, interaction and dedication which came from all the kids, how they showed themselves and shared some of the deepest aspects of their lives with openness. Also, being in the same art classroom where I once studied and standing in front of a Teto art class was a moving experience. And lastly, witnessing the talent in the work produced by the kids, with some who had never before held a camera was quite remarkable. What themes play a big role in the photos of the students? A lot of the kids diligently followed the intended theme of Who Am I in 2017? We saw a lot of personal stories showing living environments, living conditions and daily lives at home with family or at school. We also saw a few daring photojournalistic documentations of events that were happening. A majority was not shy to take portraits of themselves, friends, family, even strangers and personal encounters on streets. Some already started to experiment after seeing inspirations from the lessons which made us wish we could spend a longer time with them and witness their progress. What are your plans for 2018? Concerning Welkom but also other professional plan? For the next phase of Welkom Today the plan is to photograph Welkom with Ad while also gathering an archive of older images from the community of Welkom. This process has already begun and will continue with the support of the Welkom and Thabong residents, local radio stations and newspapers. All these documentations including selected work from the schools will end up in a publication intended to launch in 2019. I am currently exploring strategies and looking for support to continue offering workshops at schools in Welkom and beyond. So far there has been interest from students, school principals and the community to continue. I will also register an organization called Spaza Institute for Arts that will be a structure to further my goals in developing socially relevant and sustainable projects in communities through art and photography. 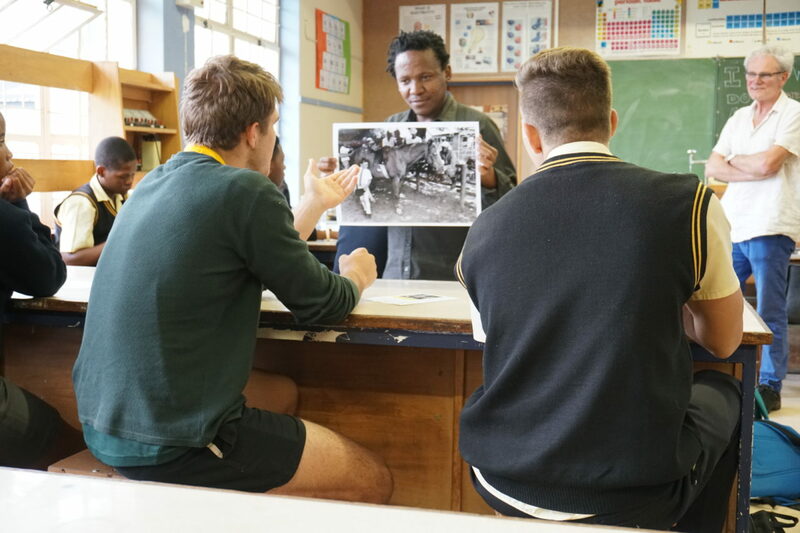 Lebo shows the photos of Welkom by Ad van Denderen at several schools in Welkom. 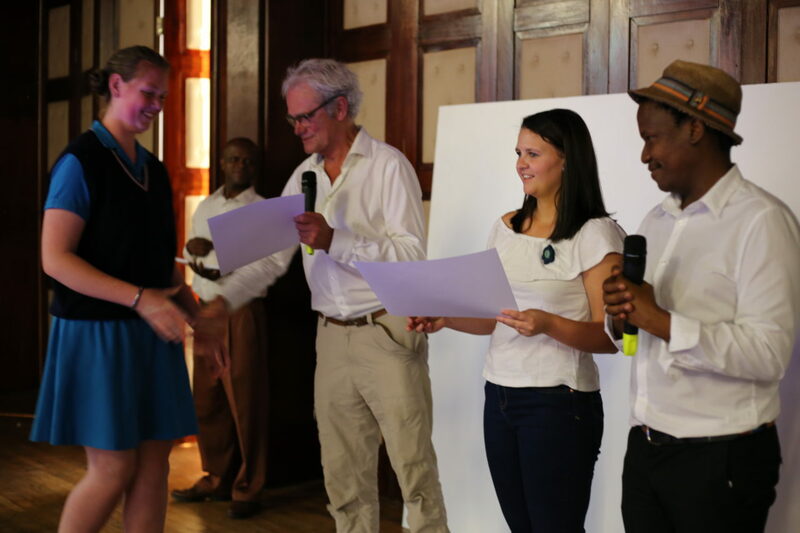 Workshop by Ad van Denderen en Lebo Tlali in Welkom, February 2017. Every student gets his or her own diploma, handed out by Ad and Lebo. 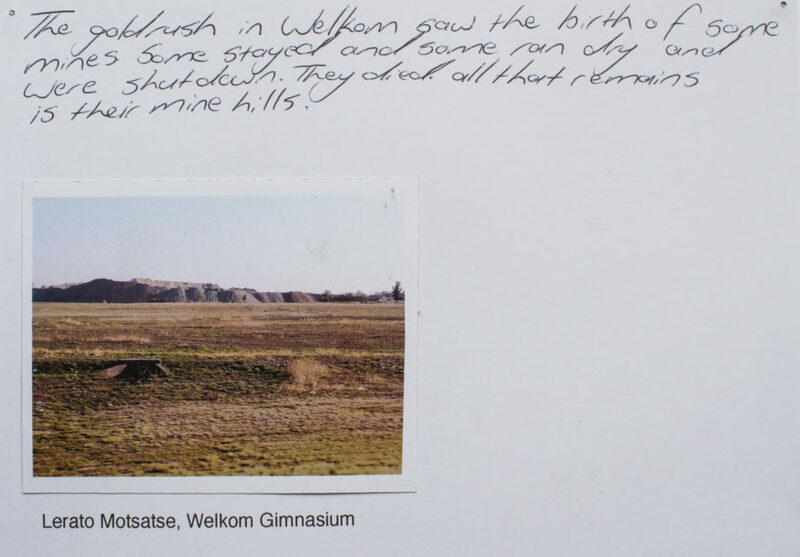 'The goldrush in Welkom saw the birth of some mines. Some stayed and some ran dry and were shut down. They died. All that remains is their mine hills.